Beautiful craftsmanship. Attention to even the tiniest details. Low profile makes for easier packing, and the leather is of excellent quality. This is a Christmas present for my husband that will last for years and years to come. This travel case is just beautiful and my son really loved receiving it for Christmas. It's roomy and has a great feel to the leather. Maybe not putting your logo dead center? Something small and inconspicuous would be preferred since the bag talks for itself. High quality. I was very pleased and thrilled to give it as a gift. Bought these for my sons who were both extremely impressed by the craftsmanship ( and the amazing leather smell!). The only drawback was that one of them can't fit all of his travel toiletries in it. Too bad they don't make a bigger size. It's much smaller than I expected, but my husband seems to like it. 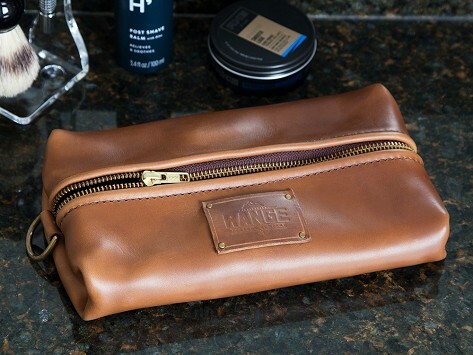 A passion for craftsmanship is evident in the men’s travel accessories from Range Leather Co. Founder Kyle Koster’s deep respect for the history of working leather by hand grew into a commitment to preserving this American tradition. Every piece is handcrafted with care, and is designed to wear in and look better with time and use—but not wear out. It all starts with full grain, Horween leather. The leather is then hand-stitched the same way saddles are—which is to say, carefully and precisely—then accented with copper rivets and brass hardware for extra durability. 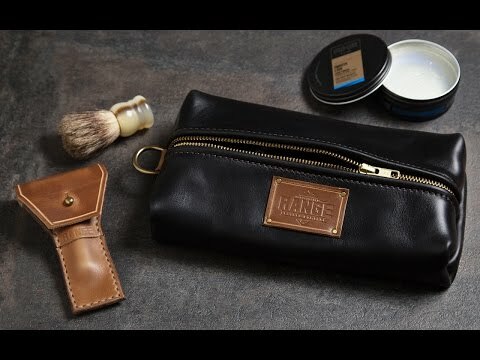 After he cut himself reaching in his bag for a razor, Kyle created the fitted leather cases that shield sharp safety and cartridge blades. He then developed the Travellr Dopp Case with a flatter, more compact design to eliminate some of the bulk of packing.